A hot cross bun is a spiced sweet bun made with currants or raisins and marked with a cross on the top, traditionally eaten on Good Friday in the United Kingdom, Ireland, Australia, New Zealand, South Africa, Canada, and India. As such, they mark the end of Lent and different parts of the hot cross bun have a certain meaning, including the cross representing the crucifixion of Jesus and the spices inside reminding Christians "of the spices put on the body of Jesus." In many historically Christian countries, the buns are traditionally eaten on Good Friday, with the cross standing as a symbol of the crucifixion. 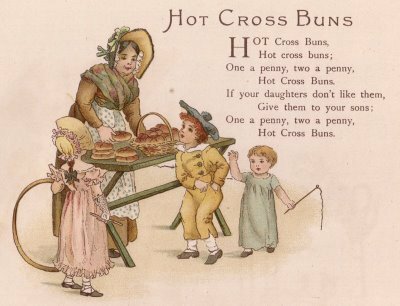 They are believed by some to pre-date Christianity, although the first recorded use of the term " hot cross bun" is not until 1733. According to food historian Elizabeth David, the buns were seen by Protestant English monarchs as a dangerous hold over of Catholic belief in England, being baked from the consecrated dough used in making the communion wafer. Protestant England attempted to ban the sale of the buns by bakers but they were too popular, and instead Elizabeth I passed a law permitting bakeries to sell them, but only at Easter and Christmas. English folklore includes many superstitions surrounding hot cross buns. One of them says that buns baked and served on Good Friday will not spoil or grow mouldy during the subsequent year. Another encourages keeping bun for medicinal purposes - A piece of it given to someone ill is said to help them recover. If taken on a sea voyage, hot cross buns are said to protect against shipwreck. If hung in the kitchen, they are said to protect against fires and ensure that all breads turn out perfectly. The hanging bun is replaced each year. Traditional Ferguson Plarre Hot Cross Buns were first baked at the start of the century but our premium Chocolate Cross Buns only arrived in our shops in 2008! Our traditional buns are famous for their generous quantities of fruit and are the result of a culmination in pastry-cooking experience gleaned by Percy Ferguson & Otto Plarre over a combined period of more than 100 years. 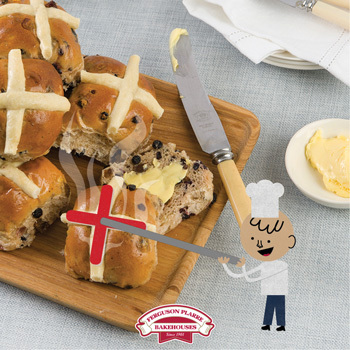 We invite you to try our Hot Cross Buns... now a family recipe for nearly 100 years. Extract from the Ferguson Plarre book "A Recipe for Success": The Hot Cross Buns Episode (1912) . 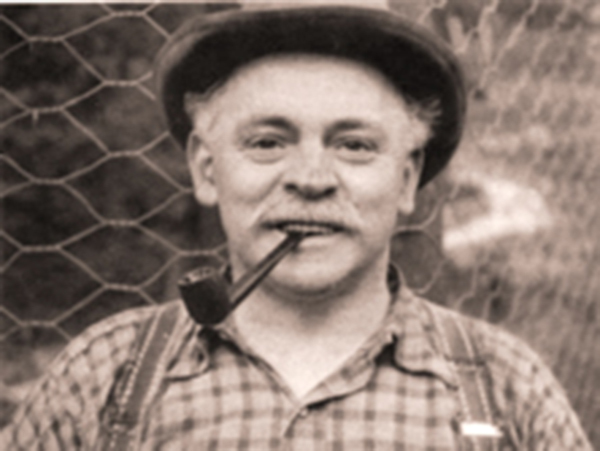 Otto Plarre & Percy Ferguson excelled at making Hot Cross Buns and became famous very quickly for their skill with this product. But Otto's first attempt at supplying the Easter shoppers was disastrous! Otto had prepared a large batch of buns on Easter Thursday and they had sold exceedingly well. 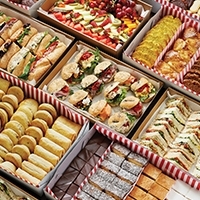 Expecting most sales the following day – Easter Friday – as was the case in Europe, Otto prepared an even bigger batch, only to learn that his new Australian customers did not shop on that day. He was left literally, holding the bag. Otto Plarre & Percy Ferguson traditionally baked very rich hot cross buns. There was always as much fruit as flour and subsequently their Easter buns became very famous. 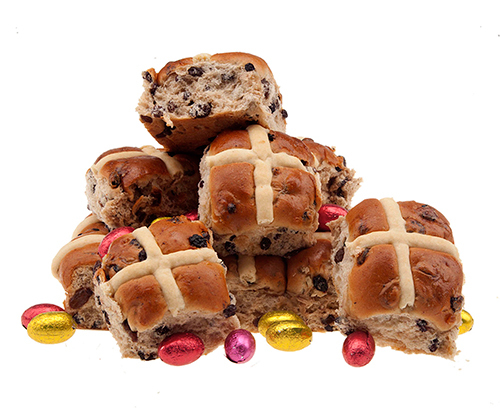 Ferguson Plarre's Traditional Hot Cross Buns are typically on sale between 6-8 weeks before Easter (depending on when Easter falls), because, unlike some other bakeries, we pride ourselves on helping to keep Easter special.